I discovered Disney's blog, Ruffles And Stuff, a few years ago when I inadvertently stumbled upon one of her craft tutorials during my lunch break at work. 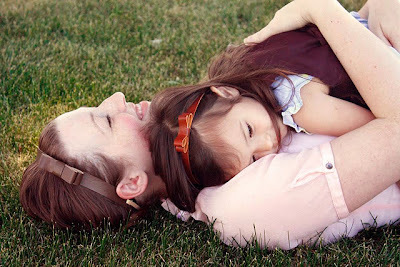 It was love at first sight, and I happily spent my lunch breaks from then on scouring her blog for fun ideas and gleaning peace and comfort from her encouraging posts. As I prepared to host this series, I decided to "shoot for the moon" and send an email to Disney, asking her if she would be willing to guest post. I nearly fell off my seat when I received a reply within an hour saying that she would be happy to write for me! Thank you, Disney, for taking time out of your beautifully busy life to share your heart with us today! This post was so much more difficult to write than I thought it would be. "Write about homemaking? Sure! Piece of cake. After all, I live it!" 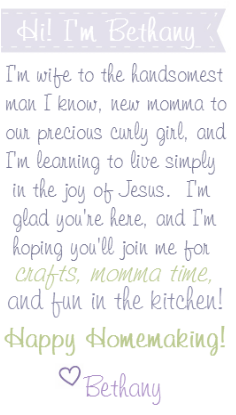 But there are so many different aspects of homemaking that I really had no idea where to start. 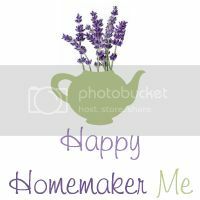 As I was sharing these thoughts with my husband, he asked "Well, what is your favorite thing about being a homemaker?". Ah. Hands down, it's being able to be at home with my daughter. My husband and I decided before we got married that if we ever had children, we would do everything we could to make it possible for me to stay home with them. So, when I was five months pregnant with our daughter, Paige, I quit my job and for the first time in my adult life I was unemployed and at home. The next three or four months were pretty great (although a little boring at times); I felt free as a bird! What a great life this was going to be. At this point most of you can guess where my story is going. The moment my daughter was born, "free as a bird" flew out the window. Almost since her first moments of life, that sweet angel was the queen of high-maintenance. From refusing to sleep to refusing to be alone, from refusing to latch properly to refusing bottles; she wanted me to know that I was at her beckon-call at all times. By now, (four years old) she's a little more pleasant to be around, but her strong will and bossy--ahem--"leadership oriented" attitude makes her a full-time job and a half. Just today, as I was trying to think of ways to include Paige in the household chores, I asked her: "Paige, what would you like to be in charge of?". She paused for a moment, then looked at me and replied: "Everyone." That's my daughter! She is bold and strong, and so smart. I fully believe that God has plans for her to do something incredible for Him someday, but the idea of it being my job to prepare her for it, frankly, makes me want to pee my pants. I still don't even know how to guide my own life, let alone hers! I said all that to say: being at home with kids all day is hard and scary, by far the biggest challenge I've ever faced. But it is my favorite part of being a homemaker because I know that of all the things I could do in this world, raising this girl will make the most difference. My big chance in life isn't to have a successful craft blog or to write books or do seminars; Paige is my big chance. She's my life's work, my greatest opportunity. And any earthly thing I need to give up in order to help God mold her and shape her is my pleasure. When I reflect on my feelings for Paige, I can't help but think of God's feelings for us. What silly, stubborn little people we are. :O) And yet He would, and indeed did, give up anything to train us, mold us and perfect us. How His heart must break when some of His children grow up and move away from Him, never coming back. I pray that we never become those children. I also think of what a wonderful example of a perfect parent we have in our heavenly Father. Whenever I have doubts of the specifics of my job, I think of God's wise, patient, firm and loving ways and it puts things into perspective. I'll never be a perfect mom, but using God's standards certainly points me closer to that goal. I wish I had more specific tips for you all, but I'm still quite in the learning process myself. All I can say is: study God's love, and pass it on to your family. Disney, I really loved this. Thank you for the sweet reminder. What a sweet post! I loved this! So inspiring. Thank you for sharing! I can't wait to be a Mom and experience the overwhelming blessing of it. Thanks Disney! Thank you Disney! I very much enjoyed and completely agree with your post. I love looking to our Heavenly Father and the perfect example of parenthood He sets for us. It's nice to know your thoughts and goals in being a mom are so much like my own. It makes me feel a little more normal and little less crazy. Thanks again! Disney, I totally know how you feel. I love my children they are the greatest gift God has given me and treasure them so very much. It is scary to guide them, to make sure they grow up to be all they can be. I pray every night for Him to guide me in the right path of motherhood and to give me more patience and the wisdom to raise my children. And every night, as well, I thank Him for allowing me to be with them one more day. yeah, i love disney!!! and she writes so well, very well said!!!! With my 5-months-old-today son on my lap sleeping, I am so totally in agreement. That was beautiful Disney. And I feel the same way about my children, and the blessing of being home for them and my hubby.